Free Printable Certificate of Baptism. 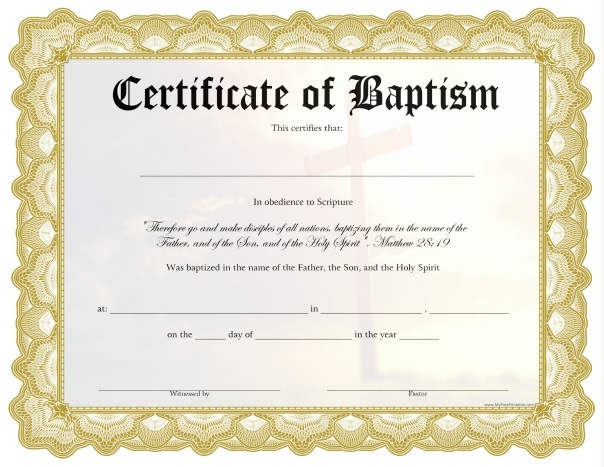 Print the Free Printable Certificate of Baptism, for your next baptism ceremony at your church. Great free certificate for the church that needs a certificate fast and can’t wait for the order to arrive. Includes a beautiful cross background and gold frame. Please print with printer’s best quality settings and quality stock or heavy paper, and give to the new member of the church on Baptism day. The free certificate can be easily personalized using the included form fields. You just write the new member name, church name, city, state, date and witness and Church’s Pastor signatures. Click the link below to download or print the Certificate of Baptism free in PDF format. Therefore go and make disciples of all nations, baptizing them in the name of the Father and of the Son and of the Holy Spirit, Matthew 28:19 (NIV).